In anticipation of his upcoming self-titled studio album, superstar Shawn Mendes is spending the evening with someone very special – YOU! 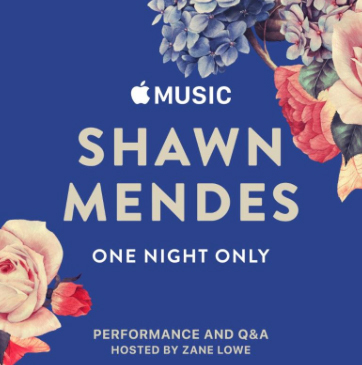 Join Apple Music on Thursday, May 17 at the Ford Theatres in Hollywood, CA as Shawn performs a special set including new songs from his upcoming album. The performance will be followed by an intimate Q&A hosted by Apple Music’s Zane Lowe. Shawn caught up with Zane Lowe last month to chat about everything from the new album, dealing with anxiety, stage fright, and living on his own to how Camilla Cabello is his “favorite person in the world” and much more. Watch the full Interview HERE. Grace Mitchell To Join The Weeknd at Apple Music Festival!